Crawl into the den and explore the dark environment. Portable, easy to assemble and folds away into its own bag. 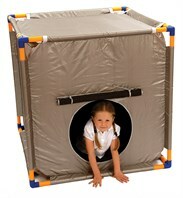 An affordable den with lots of uses. 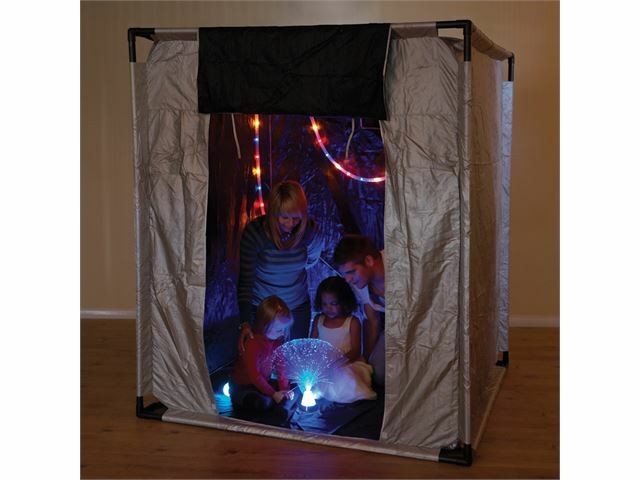 Great for using torches, glowing objects, fibre optics or just a cosy space, which can be decorated. The nylon double skin blocks out the light. Dark Den - Dimensions: 1m x 1m x 1m. Consists of 12 poles and 8 connectors. 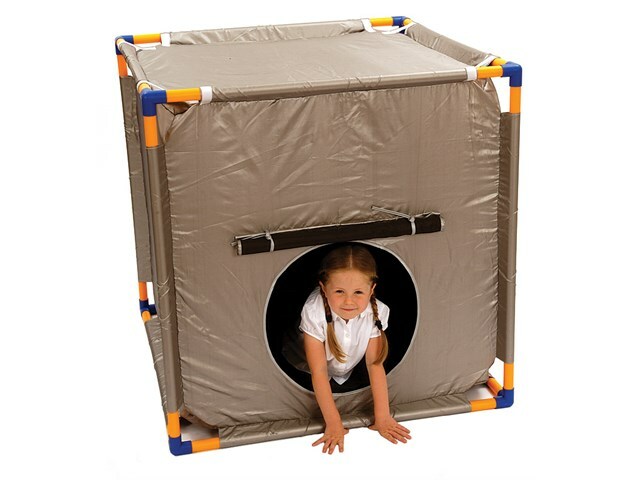 Giant Dark Den - Dimensions: 1.5m x 1.5m x 1.8m. I should declare an interest, I'm one of the founders of Inclusive Technology. On the other hand I did have the choice of 3,000 of our products and I bought The Dark Den with my own money - not even a discount! My grandchildren loved it. First they fetched torches to explore the darkness; then a miniature tea set so they could picnic in the dark. I put the den up in ten minutes: it's easy. The twelve one metre poles and eight corner pieces snap into place to form a cube of tough material - black on the inside and silver on the outside. There are two opposing doors (bad feng shui I know) and a small window all of which close to preserve the gloom. The den is a metre cube so the inside space is 1,000 litres and, if filled with water (don't try it) would have weighed one metric tonne. Back in the early eighties when I taught maths in primary school I would have milked this for weeks. For instance if you have manipulatives like centimetre cubes you can show what "a million" looks like while a plastic litre cube would fit inside exactly one thousand times. One of my less expensive successes as a Grandad.